Tame & Perfect Your Style! 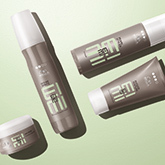 Create lasting body and fullness with EIMI Volume range! 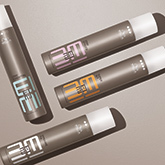 Tame and perfect hair with EIMI Smooth range! 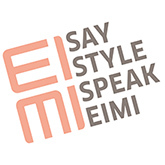 Create textured, rough style with EIMI Texture range! Add glistening shine, shimmer and gloss with EIMI Shine range! Fix hair in place and protect hair from the effects of humidity, UV and heat. 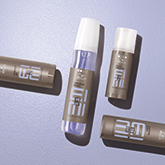 View all Wella Professionals EIMI Hair products in one place. Wella Professionals was set up by Franz Stroher after he looked into current hair trends, his first focus was actually making tulles which are the bases for wigs.1980 saw the invention of the tullermoid waterproof. Soon after the Stropher brothers brought into their fathers business. After wigs started to go out of business brothers Karl and George looked into women’s beauty needs, and came up with a perming appliance which was designed to give women permanent waves. This was the first to be mass produced. From there their innovative products continued with them developing the very first hairdryer with a built-in motor. Wella continue to create new, unique hair styling, colouring and haircare products. One of their most famous lines being Koleston which increased the company’s popularity. In 2015 Wella Professionals launched a new line – Wella Professionals EIMI. This line is their styling range, a collection of products made for you to have creative freedom over your hairstyle. 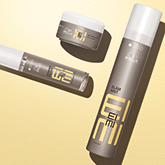 Wella provides EIMI texture products, and EIMI smooth products. With sprays, mists, mousses and creams, you have everything you need for your perfect look! 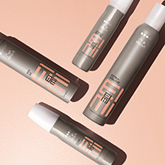 Wella Professionals EIMI Perfect Setting – a lightweight setting lotion which is designed to create lasting volume and shine to hair, whilst protecting from heat damage. The spray applicator means that your luscious locks won’t be drowned in product! Wella Professionals EIMI Root Shoot – a root lifting mousse which is the perfect product to create outstanding body and volume to the hair with a long-lasting finish. Leaving you will a killer hairstyle. Wella Professionals EIMI Pearl Styler – this medium hold gel can be used to create texture and re-workable style, with a shine finish. Due to the versatility of this product, there is an array of different looks you can achieve from just this one product – a natural, tousled look, or give extra lift to those shorter styles.